The next SI course in Ankara is confirmed to run with a few more seats available. This is a great time to jump on and secure a seat. Flying into and out of Turkey is surprisingly cheap these days and when coming from the euro-zone, everything in Turkey recently dropped to an amazingly low price level. Please go straight to Doulos for the sign-up. Following this course, we will have London/Ringwood and Munich in May and London/Ringwood again in September. If you want to organize an on-site course, please get in touch directly – or talk to Doulos. This makes sense from 6-8 people where you save a lot on travel. 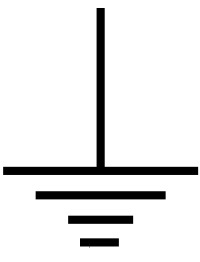 If you have been to one of the signal integrity classes, you will know about ground bounce. And VCC bounce. It’s one of these bad things that really can ruin a project. This group of students is lucky enough to have Eric Bogatin as their instructor, and obviously, they go through ground bounce as well. They even build a board showing that effect. Some of the students got inspired to write a small piece for the Signal Integrity journal: “We Live in White Space“. A fast and easy read. 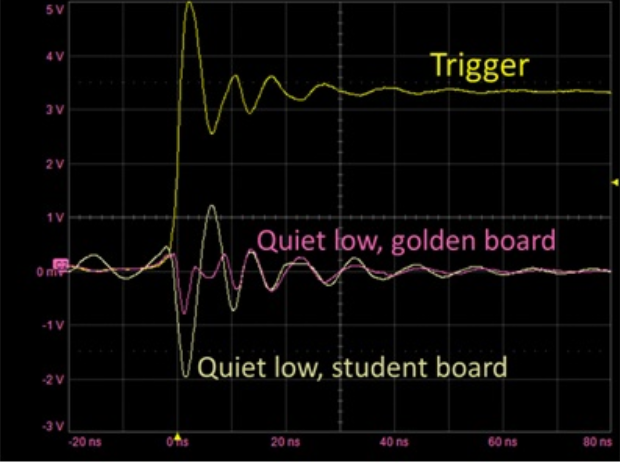 We should maybe include a number of eval boards from various chip vendors, as the bigger (BGA) devices are too much to put on a student board in the class setting – yet may still have a significant ground bounce or VCC bounce. What bigger device have you used recently with significant ground bounce? 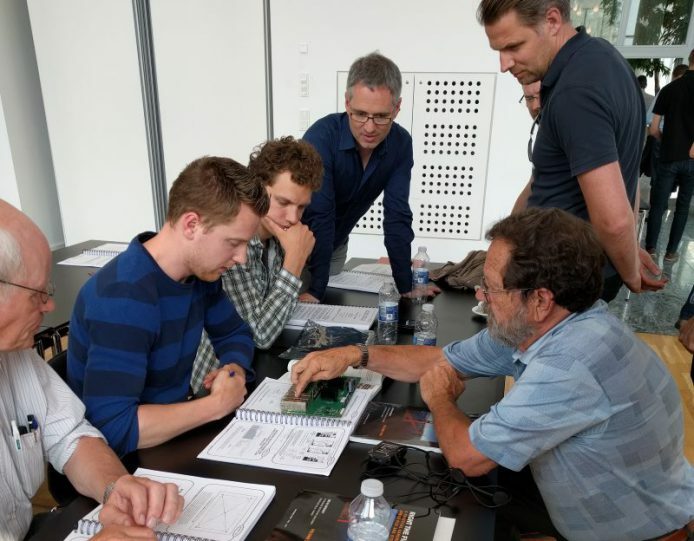 We have Espen back in Copenhagen with the best ever FPGA verification course. Complete with best practice for both development and verification this course is a must if you are serious about FPGA development. Please use promo code VCPH17Q3-45 for €100 discount. More participants from the same company can get an even better discount. Read more about the course – or how to sign up. We run the course in Ørestad close to the airport and 15 min from the city center by metro. Super convenient and easy to get to by train/plane/car. Just confirmed to run: the next 3-day signal integrity course on Aug 1-3, 2017 in Ringwood just outside London organized by our friends at Doulos. There are some extra seats, so please talk to Sandra from Doulos ASAP if you want a seat (phone: +44 1425 517625). Each seat is only £1895 – and if you ask nicely they will even help you to a cheap place to sleep at the Star Inn just next door. With these courses, you can choose to use Mentor Hyperlynx or Cadence SigXplorer as we have both running in parallel for the Hands-On labs. Doulos is organizing another 3-day signal integrity course on Aug 1-3, 2017 in Ringwood just outside London. Now is the time if you want to join in – the gate closes Jul 15, so get in touch with Doulos before that date. A great time of the year to spend an extra day or two in London if you don’t come there too often. Just a quick note to let you know the memory course “Open the Black box of Memory” is confirmed now and will run on May 30+31, 2017 in Copenhagen. One of the interesting shifts Herman Ruckerbauers sees in the industry is LPDDR4 getting momentum. Going forward it may well be LPDDR4 for solder down and commodity memory for DIMM based designs in the near future. Join the course to be well prepared for making this design decision when you get to that point next time. Oh, and the course is arranged in a great location close to the airport and close to the city (by train/Metro). And with a late start so you can fly in on the morning and save a hotel night that way if you want – or come the day before and explore beautiful Copenhagen. The course is organized by Doulos – so they are the contact point for signups. We all use “ground”… but what is it? Apparently our good friend Lee Ritchey spent his Christmas writing an article about just ground. This is no doubt the best article I have seen on the subject in all of 2017 🙂 Highly recommended. And it has already created quite a number of comments on SI-LIST, where SI is discussed on a daily basis. Definitely a subject of great importance. Happy new year to all – and let’s meet somewhere this year! PS: I am in Munich with the 3-day Signal Integrity with Hands On course on Feb 20-22 and in Ringwood, UK outside of London on Feb 14-16. Both courses are organized by Doulos – so they are the contact point for signups. 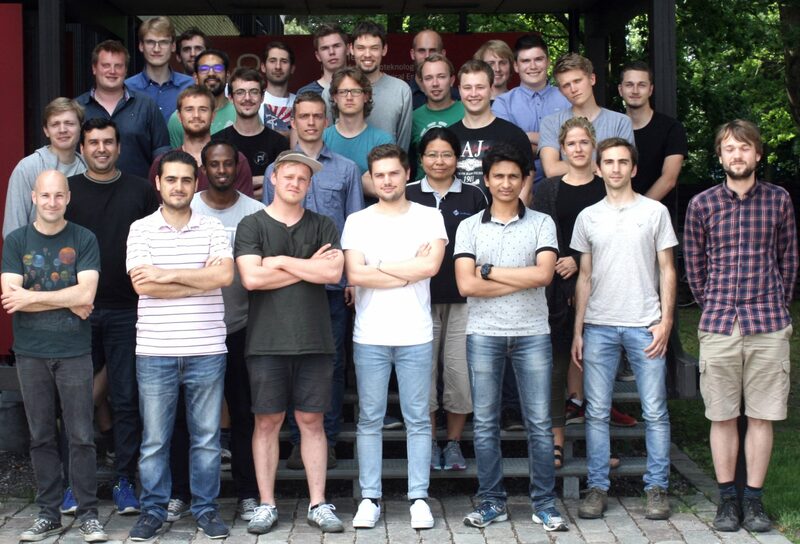 This summer we passed 30 new signal integrity students at the 3 week summer course at Danish Technical University (DTU). This is more than twice as many as the previous years. Why? Well, the course is now on the official list of recommended courses for EE’s. With this many students, we need more industry projects for those who want to get really good at signal integrity. Both in the form of internships, projects, student jobs and thesis projects. So bring it on. I will gladly pass on the information and hook you up with some great students. Shoot me an email if you have an interesting project. DTU is falling way behind on modern equipment. 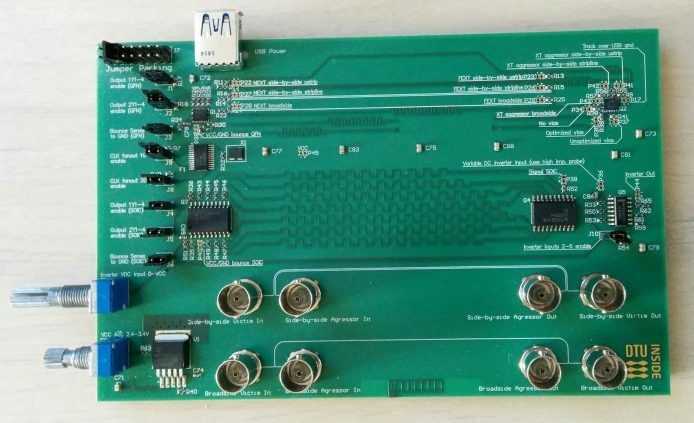 For this course, where we try to get the students to be able to understand the reality of designing electronics today, the type of equipment really should reflect the present – not the past. Unfortunately the equipment available is so old and outdated that it is really difficult to make meaningful lab exercises on several of the topics that are covered in the course. The cost of equipment may look high as an up-front cost for the investment, but when you factor in that most of the equipment we use at DTU is 10-15 years old, the yearly cost is really not that high. I do not think that DTU will get their act together and support an important course like this, so I think the initiative has to come from the industry. As a thought experiment: Suppose 10 of the larger danish companies sponsored just DKK 6000 per year… that would pay for a 5 year loan to buy DKK 3M worth of equipment. That is enough to make a significant difference. We are really talking pennies here – who wants to pick up the ball? Last week was dedicated to signal integrity in Copenhagen: SI Week 2016. We had some very good questions and discussions this year during the 3 courses on Signal Integrity, Simulation and Stackup Design. A couple of engineers discussed their current designs with Lee Ritchey. Rolf explained all the topics in the context of the course comprehensively and coherently. All questions were answered. Great way to start using important simulations. The simulation day was surprisingly relevant and augmented the SI course in a good way. Good with the practical/hands-on practice to complement the theory in the SI course. Thanks to all who participated and helped making it so successful. Enjoy your summer – we will be back with more good courses after summer. PS: If you missed this, but still want signal integrity training… Go sign up for the next SI courses in November (Munich and Ringwood/UK). Or organize an on-site at your company (need 8+ people).